This spectacular peacock sculpture has brilliantly colored plumage that "flutters" when the wind blows. Real, live peacocks sure are stunning—and boy, do they love to dig up flower beds in pursuit of yummy worms. 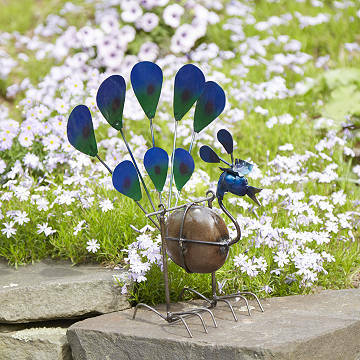 This spectacular peafowl, handmade from lake rocks and welded steel, is content to just stand in your garden looking gorgeous. When the wind blows, it rocks gently back and forth, fluttering and flaunting its brilliant feathers. On the lawn, poolside, or even indoors, it truly embodies a famous line of poet John Keats: "A thing of beauty is a joy forever." Handmade in Mexico.